Tangled and True: Silly Wagon Auction #1. Silly Wagon has asked that we host their auction items, and we're more than happy to help. 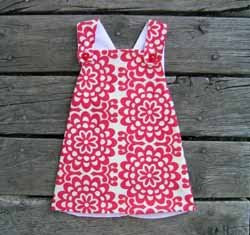 The first of their auctions is this darling pinafore. In one of my all time favorite Amy Butler fabrics, Pink Dixie has done retro right! Perfect for a warm summer day or over jeans and a long sleeve tee (a favorite look of mine).